This is the real reason for open borders and no voter ID laws. Hat tip to Zero Hedge. Update: House Democrats voted Friday to defend localities that allow illegal immigrants to vote in their elections, turning back a GOP attempt to discourage the practice. As The Washington Times reports, the vote marks a stunning reversal from just six months ago, when the chamber – then under GOP control – voted to decry illegal immigrant voting. As we detailed earlier, using carefully chosen words in what appears an attempt to hide the truth, House Speaker Rep. Nancy Pelosi admitted this week at a news conference on voting rights with Rep. Lloyd Doggett (D-Texas) in Austin, Texas on Tuesday, that Democrats want illegal immigrants to be able to come into the nation freely, across their open borders, in order to rig elections for the Democrats. 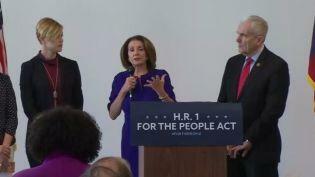 As CNSnews.com reports, Speaker Pelosi spoke on the importance of passing H.R. 1, the “For the People Act of 2019,” “to lay the foundation to pass the Voting Rights Act, strengthened after the actions of the Supreme Court, which significantly weakened it,” she said. “So, when we talk about newcomers, we have to recognize the constant reinvigoration of America that they are, that we all have been – our families,” Speaker Nancy Pelosi said. Additionally, we note that friend-of-AOC, Rep. Ayanna Pressley may have outdone Pelosi with her latest stunt, an attempt to lower the federal voting age to 16.